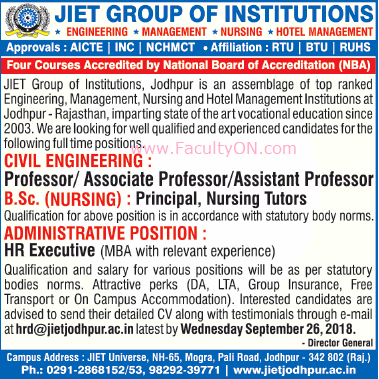 JIET Group of Institutions, Jodhpur has advertised in THE TIMES OF INDIA newspaper for the recruitment of Professor / Associate Professor / Assistant Professor / Principal / Nursing Tutors Plus Non-Faculty jobs vacancies. Interested and eligible job aspirants are requested to apply on or before 26th September 2018. Check out further more details below. About College: JIET Group of institutions (JGI) is committed to building a diverse and inclusive academic culture that fosters creativity, risk – taking, continuous improvement, leadership and entrepreneurial spirit. In order to equip our learners with the skills required to deal with the uncertainties of tomorrow, we not only inculcate in them the time-tested values and ethos within a happy and creatively charged environment, but also successfully integrate modern technology in their learning process. How to Apply: Interested and eligible candidates are requested to submit application along with CV, xerox copies of certificates and PP size photo to the following email address.